Well over a year ago I had plans of a solo microlight trip to investigate the wrecks of the West Coast travelling as far as Angola. Around this time I also came across an advert from trip leader Joe Standuhar offering any pilots the opportunity to join his expedition to attempt the first group circumnavigation of South Africa. As this took us most of the distance up towards Namibia I figured this would probably be a great start. 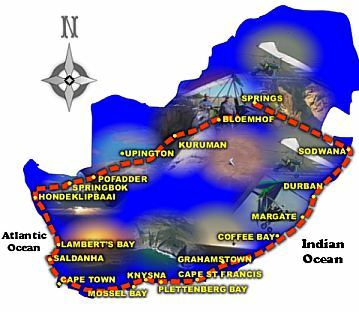 The planned route would take us from Springs direct to Sodwana bay, a distance of 450 kms on the first day, then route Southwards to Durban, continuing to Cape Town, up the West coast and back across the interior Via Upington, Kuraman and back to Springs 3 weeks later. So in late March 2003 I found myself, the only microlight pilot from Kwa Zulu Natal towing my plane to Gauteng. The following day assembling and packing our back up vehicle and early Saturday departing. Originally five planes were to attempt the trip. Myself (DBN), Joe and Duane Campbell from JHB and two trikes Andrew Conroy and Derek Van Zyl in one and Jamie Mundell in the other from the Kimberly area, however bad weather delayed their arrival forcing us to rendayvew with them in the Durban area. Leaving Springs we were accompanied by Marius Dreyer whom joined us as far as Secunda and Nico Van der Merwe who traveled as far as Coffee bay on the Natal South coast. Luckily day 1 provided us with a good tail wind giving us a ground speed over Paulpietersburg of 82KTS/h, however did little for the turbulence and even at 9500 feet we were rocking and rolling and bounced all over the sky. As if this wasnt enough, I having the slowest plane set me at the rear for the entire day, positioning me directly and unquestionably in that entity aptly named prop wash. Pongola was one of the thermic areas I have ever come across and attempting to descend at mid day was an almost impossible task. One would spiral down wards only to find one ascending again on exiting. A sail plane pilots delight. Ground temp in excess of 43 deg c. On to Sodwana to find the coastal wind howling and anything that was standing more than a few feet high, found its self flattened earthwards. This dictated that Duane; our guinea pig was to undertake the precautionary landing at Sodwana, however after causing a local to abandon his intentions of runway maintenance we opted for Mbazwane (just inland). With a huge storm brewing in the distance we hastily derigged the wings and made our way into Coral divers where thanks to Stewart Robberts we attained complementary refuge in their chalets. (A really great set up thanks). Onto Empangeni passing LK St Lucia and inaccessible terrain in terms of recovery. One of the not too pleasant thoughts I would soon become very familiar with. Arriving Empangeni required repairs to Daves Accelerator system, which had taken water during the storm and now operating intermittently. Thanks to Melvin& Sebrina Luff and Dirk & Anebelle Booysen for the hospitality offered to us. Leaving Empangeni with a head wind required some low level beach flying with a few small rain squalls to La-mercy, only to be met with the wrecked trike of two Natal microlighters killed the day before. A really sobering sight at the beginning of such a long journey. Routing onto Cato Ridge our group became separated with me landing at Cato (a good choice in retrospect as John Young was present with coffee and biscuits-thanks), while the others travelling to Emoyeni. Our route then traveled to Margate across the Umkhomaas valley where my plane began to splutter and cough luckily at 5500 feet allowing Duane and Nico to check out the best of a bad situation- a dirt track in the middle of moon terriority. Landing in a howling cross wind on a narrow uphill track amongst numerous indigenous residents without an engine wasnt my idea of a morning outing to the coast. Hitching a ride to Hibberdene, finding our back up vehicle I returned to retrieve the trike. The following day saw two trikes now heading for coffee bay with two up, which in a way wasnt too detrimental as this allowed flying to be shared and photos to be taken without having to concern ones self with directional control. This part of the South coast is incredibly beautiful with shear cliffs descending straight into the sea. Again not a great place to have an engine out. Our back up driver now deciding he had had enough was returning home to Potch meaning we now had to be completely self sufficient for the following 3000 kms or there about. (As it turned out this really was not such a big deal and probably easier should one be embarking on an extended microlight tour). Take off from coffee bay was from the beach and one or two tense moments were experienced due to 75ls of fuel, a passenger and the tide just turning, however all was well and on to Trenneries where we met up with Robert Gassman again. What struck me on this sea leg was the number and size of the sharks that we spotted often lurking just off the river mouths. (Another reason to maximize your glide to the beach when flying over water!) We caught up with two jet skiers over this section (oblivious to what lurked below and around them) who had left northern Kenya a few months back and were on their way to Cape Town, making incredible footage from the air. Trenneries took us onto Grahams town Via Port Alfred, where Joe, myself and Duane turned back 15 minutes into the flight after I asked Joe whether his under surface of the wing has always looked like it did! Anyway finding all battens intact and unbroken we flew up to the air show the following morning where we were joined by David Beard from Tzaneen area and Larry Mcgillevie from Grahamstown and routed to St Francis bay through some very low cloud around the Van Stadens river bridge area. Having the local pilots such as Larry and Patch around was incredibly helpful not only in terms of radio calls and frequencies but also for directional routing over and through the local terrain. Routing on towards Plettenburg bay brought some awesome scenery however rather hostile terriority again, in terms of where to land should the need arise. The entire coast passing Tsitsikamer revolves around side canyons entering the sea, large trees and rugged cliffs dropping straight into the water. A coffee break with a local resident Doug was certainly much in need and very appreciated, before flying into Stanley island in Plett. From here a good tail wind took us onto Andrewsfield near Struisbaai and a landing in a 35KT wind. The area just prior to this, which is highly restricted, hosts one of the largest satellite tracking stations (funded largely by the Americans) on the African continent. All space shuttles launched from the States seem to take a direct route over here where they are capable of being monitored. The next day saw us bid fair well to Larry at the most Southern point of South Africa Cape Aghulus and apart from a few members heading above the clouds out towards Antarctica, a very scenic day of flying past seaside villages was had. Passing Hermanus we slowly started running into a headwind that caused extremely bumpy flying while rounding the cliffs and magnificently high mountain walls into Gordons bay. A relief I think was had by all when we reached beach again and a short hop onto Versantekraal. (An old world war 1 runway and hanger). A well needed two days rest and an introduction back into the bright lights of Cape Town was welcomed before leaving for the west coast via a brief stop in Saldanah. This area boasts what probably was one of the largest oil and fuel reserve depots on the African continent. Designed way back in the apartheid days during the boycott of South African imports, this underground reserve (stocked via the back route from overseas countries) was a logistical necessity to the continuation of industry and infrastructure alike. (An interesting point while on stockpiles was that during this regime where world pressure was at its peak, many of our old mines where partially filled with water, then pumped full of oil. As most aviators know the density of water results in it sinking towards the bottom with oil and fuel rising to the top. As seepage slowly dropped the level more water was pumped down to prevent the oil levels dropping to ground and disappearing). Almost immediately the scenery started to change to the barren, arid desert land common to this stretch of land and cold Atlantic ocean. What was interesting about this west stretch was the amount of warm and cold air pockets, and incredibly warm inversion layer, which became uncomfortably warm higher up. A head wind on the ground resulted in us climbing to 800 feet where still air predominated and a more favorable ground speed presided. Miles and miles of barren beach allowed for some low beach flying with numerous schools of dolphins all along this section. As one progressed northwards one entered the diamond mining concessions with graders sometimes working right up and into the water removing gravel for sorting. Vast areas of wasteland are simply removed as if some nuclear devastation had dominated the area. Every now and again isolated so-called campers or rogue diamond prospectors could be seen situated literally in the middle of no where. Arriving in Lamberts bay saw us land on the main road just outside town along a well known sea food restaurant which also became our abode of residence for the evening. Onto Honderklipbaai brought very similar barren scenery and like many areas still ahead, engine problems here would simply mean dumping the plane, not even bothering to de- rig and hitching a ride onwards with another plane (if one could take off again). Honderclipbaai saw us land between two telephone lines on one of their roads and taxi to the local shop, only to find that the one and only petrol pump was last operational two years prior. This small west coast town is dominated by diamond mining interests with a European population of around 20 permanent residents. As one now progresses northwards more and more diamond diving concessions are present with the diving fraternity an interesting entity on its own. This industry has prospectors and divers entering and leaving almost on a daily basis. These divers live a fairly migrant life style moving from one concession to another, hoping to find that one really big strike that will allow them to retire and return to a life of static normality. Many come in with a game plane and a time limit, while others simply spend their life drifting up and down the coast indulging in just about any and every activity legal or illegal alike. This industry, obviously due to the potential wealth involved, is however highly politically dominated and minor infringements into concession rights, operational terrain and commission payments often leads to lengthy litigation and other less formal means of out of court settlements. Many thanks to Clark Van Dyke from Visbeen Lodge (a great place offering great accommodation and meals for any travellers passing through Hondeklipbaai) for his sincere hospitality and accommodation and especially the 200km round trip to acquire fuel. What I found extremely interesting around this area was the amount of fossilized marine oddments such as vast quantities of shark teeth. These fangs are found up to many kilometers inland and many meters underground. 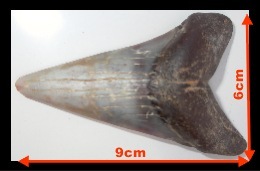 Not only is this interesting in terms of sea level subsistence however the size of these prehistoric teeth are enormous. (This whole idea of sea level rise and fall is extremely interesting. According to literature since the commencement of the last glacial meltdown, (starting roughly 12500 years ago, sea level has in fact risen significantly, in fact enough to inundate entire coastal towns, yet fossilized entities such as these and certain wrecks up on the skeleton coast are found many kilometers inland. (Indicating subsidence again). The latter may however be due to extremely high surf and tidal activity. (Can you imagine the force to position a large ship this distance inland). From here the decision was either to proceed on up towards Port Nolloth and the source of the orange river near Alexander bayor to traverse back across the interior to Springbok, Upington etc. As time was now running low many of our group thought the latter was a better option and to avoid splitting the microlights earlier than necessary, we opted for this route. The morning of our departure brought fog, typical to the west coast, right from the ground up to heaven knows where? All credit to Joe for his recci and safe return to inform us that it topped out at about 2500 feet. So at staggered intervals in order to hopefully avoid collision in this white out, we departed the West coast. Almost immediately we were enveloped in total white out with only a GPS heading to orientate ones heading, with moisture dripping almost continuously off very structural component available (it really is amazing with this amount of moisture in the air combustion was still possible). Eventually after a few minutes and around 2600 feet later we exited into bright sunlight with a vast sea of cloud extending below for as far as the eye could see, resulting in us flying on a GPS heading for the next 25 minutes until exiting out of this extended cloud bank. I believe the radio communication behind us (our radio not working again) went something like thisHey Andrew can you see anything?no, not a thing Duane,---Do you know where you are ---no, havent a clue,----Can you see anyone else---no cant even see the sun yet and have been climbing for 2000 feet:,----, A minute later Derek reports that the sun silhouette is just visible through the cloud but reference to anything else non existent. Duanes reply can also see the sun intermittently but happens to be going round in circles! Disorientation in cloud can inadvertently and easily place a pilot is a spiral dive or climb without even being aware of it. (Not being able to see the height and topography of the terrain below again resurfaced that proverbial engine out concern again). Onto Springbok resulted in wild country again and thermic inland conditions, however a chance meeting with the Masserati promotional team saw us assisting in a few photo shoots for their advertising campaign. Leaving Springbok for a routing direct to Poffader brought a problem (possibly due to the extremely hot conditions, heavy loads and descending air associated with extreme thermic conditions) with lift. Almost immediately after take off saw us with full power descending only to rocket skywards then down just as fast again. What this required was some desperate ridge soaring techniques on the windward side of the prevailing terrain and some rather interesting thermalling, which certainly helped gain a few hundred meters extremely quickly. Local help at Poffader was once again on hand with extremely helpful locals running us backwards and forwards for fuel. Dinner at the local pub and one of the nicest salads according to Joe!!! Poffader to Upington via Augrabies water fall, where we said good by to Jamie, Andrew and Derek who now routed on back to Kimberley. Extremely good views of the falls brought back memories (as did Poffader where we used to meet clients 12 years ago while running white water trips in the Orange river gorge, commencing at Ontseepkans), also of this gorge section where I last entered also many years ago during the second kayak descent of the rapids below this awesome water fall. A vehicle was very kindly made available for our disposal courtesy of Piet DuPlesi, which enabled us to explore the falls and the sprawling metropolis of Augrabies and the now vacant Augrabies hotel. Later that afternoon we departed for Upington (with us narrowly missing a telephone line due to extreme sink and heavy loads), and some fairly turbulent weather again. Our on board entertainment came on that day from Joes Zebra-Uniform call sign instead of Zulu Uniform to Upington tower and an interesting cross wind landing and Duanes victory circuits on Upingtons lengthy tar runway. Having one of the officials guide us in with the aid of orange battens reserved for usually large fixed wings introduced a certain amount of confusion from both sides and eventually in despair they were discarded in desperation and a finger pointed in the required direction instilled a bit of normality again. Next day onto Kuraman via Olifants hoek and some desperate terrain and ridge soaring reserved normally for paragliding took us out of the latter (Fuel transfer stop situated in a hole surrounded by mountains) and the mandatory bypass to the side of Sission to avoid lose missiles from blasting and on to Kuraman, arriving with the midday thermals. (Kuraman is well known world wide for paragliding record attempts due to the high cloud base and extremely strong thermal lift). Meeting up with an old mate of mine Gert Venter (who now runs Fly Kuraman which specializes in paragliding tours for those chasing world records or simply those wishing to experience a 15m/s up thermal)!, we were wisked off to the local watering hole and then onto Gerts restaurant for some of the largest T bones ever imaginable. Departing early next morning to avoid the predicted head wind saw us climbing a few thousand feet into a tail wind (ground speed low level 30KTS, at 6500 feet-58KTS) and onto Hartswater (well known for its immense cloud build up resulting from the abundance of underground water), and which apparently is not uncommon to hear Cessna pilots in summer complaining they have their noses full down, full power yet still climbing rapidly! (a lovely though when one is in a sail cloth a fraction of the weight!). Somewhere between take off and our proposed fuel stop at Hartswater we lost Duane, whose radio now had gone on the blink, with him landing on what he thought was a run way (which was probably more like someones front lawn) and now being too short to launch again from. A make shift modification to lengthen it was undertaken with the farmers help and after obtaining the co-ordinates for Bloemhoff (where we were now waiting), Duane arrived. Much appreciation must be conveyed to Hercules (a local diamond prospector and farmer) who arrived on scene and conveyed us back and forth for fuel and fetched us early next morning (after one hell of a night in one of the local pubs none of us will forget), to transport us out of town to our planes. 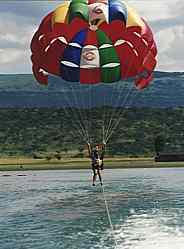 and your Free Book Gift-"An Insight into Powered Paragliding"
Do you need distilled water? By 3 methods we learn wisdom. 1st by reflection which is the noblest. 3rd by experience which is the bitterest.